The Pinoy Catholic: Manny Pacquiao, Bible Champion? Manny Pacquiao might get his chance to knock out Floyd Mayweather, but apparently religious leaders in the Philippines would rather him go toe-to-toe with Tim Tebow. "Tim Tebow became very popular by promoting the word of God," Bishop Pablo Virgilio David, who presides over the Catholic Bishops' Conference of the Philippines' (CBCP) bible ministry, told Agence France-Presse. "Some have referred to Manny Pacquiao as the Tim Tebow of the Philippines." AFP reports that during the dream, Pacquiao found himself deep inside a forest, where a voice from a shining bright light asked Pacquiao why he was going away from Him. "I woke up crying. I remember I was crying in my dream and when I touched my pillow, it was wet," Pacquiao said. "If I had died last year or in the last two years, I'm sure I would have gone straight to hell. My faith in Him was there, 100 per cent, but behind it, after prayers, I would still do evil things." "We asked him to partner with us in promoting the reading of the Bible among Catholics," Bishop David told reporters. "We told him: 'You would be a big help to us brother Manny', but he has not pledged his partnership yet." Former Manila Mayor Lito Atienza is a close friend of Pacquiao. Atienza is Catholic, so anyone here who knows the former mayor better tell him to tell Manny to stay away from the heretic pastor. Here is a video of the "Bible sharing" of Pacquiao. IF YOU WANT TO STUDY THE BIBLE AND STILL REMAIN CATHOLIC, TAKE IT FROM A CATHOLIC PRIEST, OK? Will you go to a veterinarian if you are complaining of a very bad headache? These nasty pastors only preach and want to "save" those who have the big bucks. Shows what they are really saving, eh? it seems magiging inevitable na ang conversion niya at ng pamilya niya kung walang mag guide sa kanya na catholic (priest/preacher). we can reasonably expect na sooner or later hindi na siya catholico considering na interesado ata talaga siya sa bible studies niya with a certain pastor. ganyan din mga artista eh sinasabi catholic pa rin sila after attending other church services but after a couple of weeks or months malaman mo di na pala sila catholic. i also noticed na yong mga nagplaplano at gusto magbago ng buhay na puno ng kasalanan ang karamihan umaalis sa catholicism. we have to admit di masyado kasi personal ang guidance ng church natin unlike other churches that has limited members tutok talaga ang support group nila sa mga members. i hope the catholic church and the catholics themselves address this. Rafael, actually there are a lot of Catholic groups, communities and ministries who support families and wayward Catholics in getting back to the fold. But the difference between the Pentecostals and the Catholics is that the Pentecostals approach the members personally since, like what you said, they are fewer in number so they can better zero in on their members or in Tagalog "tutok sa pag-alaga". I Was thinking about what Manny should do is to Consult a Priest Regularly,in the same lines you presented. WHETHER WE ARE CATHOLIC OR PROTESTANT we can have the RIGHT to be CALLED as CHILDREN of GOD BELIEVING BY FAITH in CHRIST." WE DON'T EVEN NEED SOMEONE TO CONSULT BECAUSE JESUS PROMISED the HOLY SPIRIT as our HELPER to TEACH and GUIDE us towards the TRUTH!!! John 14:16-17, "And I will ask the Father, and he will give you another Counselor, who will never leave you. He is the Holy Spirit, who LEADS INTO ALL TRUTH. The WORLD AT LARGE CANNOT RECEIVE HIM, because it isn't looking for him and DOESN'T RECOGNIZE HIM. BAKIT BA NINYO ikinababahala kung naging born-again na si Manny,ang dapat ninyong ikabahala at isisping mabuti eh ang mga sarili k.Kung saan ba patungo ang mga buhay natin after this life on earth. To Manny,I am very thankful to GOD na save na si Manny.At salamat din na binigyan nya ng room si JESUS sa buhay nya. dapat ka talagang mabahala kung magiging born again ka, dahil mali ang magkamuhi sa ina ni jesus na itinuturo ng mga born again, sabi nga sa bibliya na mahalin ang inyung mga kaaway ngunit ina ng dyos di nga kayang mahalin netong mga pastor ehhh... so binago ka ba ng holy ghost? just an update, i guess the pastors within and around pacquiao circle have to wait at least during the lifetime of aling dionisia, who apparently, does not want manny to change religion. here is a video link. it is about time for some concerned Catholics to steer manny towards catholic groups or ministries in his personal quest to explore the bible then perhaps the kerygyma of bo sanchez would be good for manny or el shaddai or have him and his wife to join couples for Christ or even knights of the Columbus. personally i would like manny to grow spiritually as a catholic because he has and have been an inspiration to other Catholics. even hollywood catholic actors were inspired by manny's faith. i watched in the news that Pacman will not leave his Catholic Faith! woohoo!! we have to thank Nanay Dionisia!! even though she is ridiculed by the media she is a very devout Catholic!! is it weird that i was briefly bothered by the change of religion issue involving manny? some bloggers claim that in spirit pacquiao and his family are now born again Christians. some also claim seeing manny and his family attending regularly church services at ccf. there was a photo of him attending the ordination of his alleged mentor pastor jeric soriano. According to manny, ang Bibliya ang susi tungkol sa buhay na walang hanggan. Well, Cong. Manny, Ang susi ay ibinigay kay San Pedro. Hanapin mo ang simbahan ni Pedro, yun ang sinasabi ng "susi" mo. Oh well, I hope Cong Manny will find a GOOD PRIEST who would steer him to the faith. Since he is surrounded by too many guards, all we can do is to pray. And by good priest I mean REAL DEVOUT PRIEST. I know a priest who told a born again Christian TO REMAIN PROTESTANT since we are worshiping the same Jesus. hay. Jesus himself said it HE IS THE WAY. Catholics and Born-Again Christians have the same bible. So if Manny goes ahead to read it, why are Catholics so bothered? Catholics should read the Bible too. You know what, it is not through priests or pastors or the protestant or catholic church or any other religion will be able to change your life and have eternal life. Manny is right, the Bible is the key to a changed life because it tells us about how sinful we are(the ten commandments was not given to us for us to follow but to show us how sinful we are because nobody will be able to follow them) and we deserve punishment in hell. Also the Bible tells that God sent His Son Jesus to die for us. Remember, John 14:6 says, (Jesus speaking)I am the way, the truth and the life, no one comes to the Father but through me. It's only through Jesus that we will be able to go the Father in heaven. So I'm telling you the other religions did not change the lives of the people you know, even if they remained in the catholic church or not. It is through acknowledging that we are sinners in need of the Savior who died for us, and acknowledging that He is your Savior and Lord. Also Ephesians 2:8-9 says, "For by grace are ye saved through faith and that not of yourselves, it is the gift of God, not of works lest any man should boast." Read your Bible, we may not need humans to guide us because we can ask the Holy Spirit to guide us. John 16:13 says "Howbeit when he, the Spirit of truth is come, he will guide you into all truth..."
Saveby grace, I disagree with you, when you say that the ten commandments are given to us not to follow but to show how sinful we are. That's why it was called commandment, it is the command of God for us to follow. You are reading the Bible but your interpretation is wrong. We need the Church, that Jesus started, to guide us to interpret the bible, because Jesus promised that the Holy Spirit will be in his church. I can tell that the Holy Spirit is not with you because your interpretation of Eph 2:8-9 is wrong, the WORKS that Jesus was talking about here, is the "WORKS OF THE LAW" which is circumcision. In John 16:13 Jesus is talking to the Church, that the Spirit of Truth will guide the Church, and not referring to a particular person. That's what happened when people read the bible without the guidance of the Church, their interpretation is wrong. please read your Bible and the TRUTH shaell set you FREE. if you try to follow the 10 Commandments, you are under the CURSE of THE LAW. As it is WRITTEN in Deuteronomy 28:15-68. But as for US, WE ARE LIVING BY GRACE. ENJOYING an ABUNDANT QUALITY of LIFE w/c is the GIFT of GOD (Ephesians 2:8-9) THROUGH FAITH in JESUS CHRIST. The 10 Commandment was OUTLINED by Jesus "YOU SHALL LOVE THE LORD YOUR GOD WITH ALL YOUR HEART, AND WITH ALL YOUR SOUL, AND WITH ALL YOUR MIND." This is the great and foremost commandment. "The second is like it, 'YOU SHALL LOVE YOUR NEIGHBOR AS YOURSELF." Matthew 22:37-39. Now, speaking of CHURCH. Church is ourselves!!! the HOLY SPIRIT dwells in THE CHURCH! Again, the CHURCH is ourselves!!! CHRIST also LIVES in us. As the Apostle Paul said, "I myself no longer live, but CHRIST LIVES IN ME. So I live my life in this earthly body by TRUSTING IN THE SON OF GOD(Jesus), who loved me and gave himself for me." Gal. 2:20... Furthermore, when TWO person meet together for the sake of JESUS CHRIST, they can also be called CHURCH. As Jesus said, "For where two or three gather together because they are mine, I am there among them." why we as catolic, why we are affected from that??? we are a free country, for me as long as you belive in jesus and doing right no matter what religion you have as long as you are christian... me i am a catolic but iam change also, and this is may choose to remain catolic!!! if the other is choosing other relligion, so be it.. that it is thier choice!! why will be affected of that.. let manny go where ever he goes, if that is his choice... but for me i will remain catolic as well..!!! No, Kadong. You are very wrong! The Jesus of the Catholics is not completely the same with the Jesus of the Born-again and other Christian denominations. So, NO! It will never be the same. you're right, the bible says that someone will preach "ANOTHER JESUS"
(2 Corinthians 11:4)For if someone comes to you and preaches a Jesus other than the Jesus we preached, or if you receive a different spirit from the one you received, or a different gospel from the one you accepted, you put up with it easily enough. who then is the "Jesus" you are preaching if you are still under the LAW? the Jesus that the apostles preach is Gracious, Merciful Jesus and He removed us from being under the law. the same Jesus the B.A.C. preaches. Kadong, we are taught by the Lord to "go and make disciples of all nations, baptizing them in the name of the Father and of the Son and of the Holy Spirit, and teaching them to obey everything I have commanded you" Mathew 28:19. By this verse alone it is very obvious and it is clear that it is NOT "okay" to see a Catholic just walk out of the faith while I eat popcorn since the concert is free. The people before the flood were OH SO FREE to choose NOT to join Noah in his ark...and look where their freedom led them. If i know that my brother will fall down towards a ravine, I would tell him to quit moving for him to escape perdition. I will not just STAND THERE and watch him fall. Just believe in Jesus and do something right...hmmmmmm. I have my faith in JESUS...I attended a borna gain Christians.. A true worshipers of God that worship the father in spirit and in truth regardless of religion...please add me in facebook, omar_lamrag@yahoo.com ..I can help you aLL...BEING A CHRISTIAN IS NOT OF RELIGION BUT A STATE OF BEING SAVED FROM HELL..many catholics are not Christian in heart, kagaya din yan sa mga nag sabi na born-again sila...Bur being a born again ay ung binago ng Panginoong Diyos dahil sa pag accept sa kanya 100 percent( acceptance of Jesus Christ as personal Lord an savior) . I dont care about religion. RELIGION CANNOT SAVE US. CHURCH IS NOT A BUILDING OR ORGANIZAION INDEED IT IS COMPOSEd OF EVERY BORN AGAIN CHRISTIANS ALL OVER THE WORLD REGARDLESS OF RELIGION. WORKS OF THE LAW CANNOT SAVE US. CHURCH CANNOT SAVE US. RELIGION CANNOT SAVE US. GET OUT TO YOUR RESPECTIVE RELIGION. AND PILIPINAS AY SAWANG SAWA NA SA RELIHIYON. PANAHON NA PARA SA TOTOONG KRISTIYANISMO NA SIYANG MAKAPAGBAGO SA BANSANG PILIPINAS. BE PART OF G12 PINOY. Ay wag ka mag-alala sir, di kami naiinsulto sa sinabi mo. Ang madalas mainsulto eh yung mga taong malakas magsalita na may alam sila sa isang bagay pero lalabas sa huli na wala pala silang ka-alam-alam sa pinagsasabi nila. Oh by the way, I haven't heard of the European Catholicism you are talking about in your post. You are very enlightened indeed to have found American Catholicism and European Catholicism. But I would rather stay with MY ROMAN CATHOLICISM. And...as you said Filipino Catholics merely defends the Church. It's as if defending the Church is a mortal sin. "Be sure to have a quick answer when asked about your faith" according to St.Paul. Oh I forgot, maybe St. Paul haven't heard of European Catholicism ey? Bad bad bad St.Paul. The priests and the nuns are part of the Church...BUT THEY ARE NOT THE CHURCH. If they would say something that is contrary to the Faith, we are bound to reject them. As Bad bad St. Paul said, Even if an Angel of God speaks to you and tells you something different REJECT HIM"
Quicumque vult salvus esse ut teneat Catholicam Fidem. He who wishes to be saved must FIRST KEEP THE CATHOLIC FAITH. So how come Catholics and Protestants would someday join as one? The former keeps the faith, the latter VEHEMENTLY REJECTS IT. Sabi mo (in a sarcastic way) "iba pala ang Diyos ng Katoliko at Diyos ng Born Again" NEWS FLASH OPO!!!! MAGKAIBANG MAGKAIBA! The Protestant Jesus is different, waaaaaaaaaaaaay different from the Jesus (THE TRUE JESUS) taught by the Catholic Faith. The only way for Protestants to join Catholics is for them to REJECT PROTESTANTISM, CEASE BEING PROTESTANTS and ACCEPT THE CATHOLIC FAITH IN ITS ENTIRETY. the same way, there is neither Catholic nor Protestantism... there is neither European nor Roman!!! START READING YOUR BIBLE AND THE TRUTH SHALL SET YOU FREE!!! Sir Armstrong, the verse that you mentioned never mentioned the word "Christian". YOU JUST ADDED THAT WORD SO IT WILL SUITE YOUR INTERPRETATION. The parallels that St. Paul is between races (Jew or Gentile), gender (male and female) and by the virtue of Baptism, race and gender are of no account anymore since they are now both one in Christ. HE NEVER MENTIONS THAT TWO RELIGION CAN BE UNITED IN CHRIST. "The same way"? How can race and gender be EQUAL to religion??? if you are saying here that there will be no more Catholic or Protestant since everyone is United in Christ, it must follow that the Catholic and Protestant could still follow their respectives belief, ergo BOTH WILL BE CORRECT. Do you believe that Catholics and Protestants are BOTH CORRECT? I don't think so baby. start reading your bible and the truth shall set you free? UHMMMMM, sir armstrong...WHERE DID YOU GET YOUR BIBLE IN THE FIRST PLACE? Oh and FYI simply reading the Bible would not automatically set you free, you need someone to interpret it. You must understand this, no prophecy of scripture is a matter of one's interpretation. 2 Peter 1:20. You have been warned by our First Pope that you can't just go ahead, pick a bible and suddenly....you will be set free. "Be sure to have a quick answer when asked about your faith"? ST.PAUL? what verse Paul said that? True Protestants are bible base people. The Catholic Church is AGAINST THAT bible teaching. They are called protestants because of their faith. They are not religious people. Catholic Church cannot stop the distribution of bible base teaching. Nowadays, PROTESTANTS become so called religion. And Jesus did not come here to create religion, but a relationship with God, the Father. It becomes religion when the absence of Holy Spirit. FACT: POPE = VICAR OF CHRIST...EQUAL TO CHRIST...BUT THE TRUE MEANING OF VICAR IS "ANTI" IN GREEK. "Thou art Peter, and upon this rock I will build my Church, upon which the gates of hell will not prevail. I will give you the keys to the kingdom of heaven. Whatever you bind on earth shall be bound in heaven; and whatever you loose on earth shall be loosed in heaven." There is only one true Catholic and Apostolic Church. Protestantism is an anomaly! Yes Manny Pacquiao is now born again! and Amen to that... BUT that doesn't mean he has changed the denomination. Pacquiao is still a Catholic ...the term "born again" is not a denomination.. he is born again, spiritually. Unfortunately, many people still misinterprets the term "born again" as a denomination... being born again christian does not rely on the denomination that you belong to.. what makes a good Christian? Is it the denomination? is it the pastor or the priest? DEFINITELY NOT.. It is the FAITH (word faith is synonymous to the word RELIGION different from the denomination which is the "group") what makes a christian is his FAITH - CHRISTIANITY. Salvation is a free grace from God answerable by our FAITH by accepting Jesus Christ as our personal Lord and Saviour. that bears works of LOVE. Unlike what others claim I strongly believe that Salvation is not contained in only one denomination (Catholics, Lutherans, Anglicans or Baptists, Fundamentalist Christianity, Pietism, Evangelicalism, Pentecostalism, Restoration movements etc.) You can be saved regardless of your DENOMINATION... what matters is your FAITH.... at the end of everything.. it is not how ANY of the christian denominations INTERPRET the bible that really matters to God... It is what's in your heart.. and what's in your spirit... and ONLY God can see the hearts of those who truly follow Christ. REOJIE SAID:Salvation is not contained in one denomination? BIBLE SAYS: I have other sheep that are not my own. I must bring them also and they shall heed my voice. So there shall be ONE FLOCK and ONE SHEPHERD. John 10:16. Obviously the denominations you mentioned are not of the SAME JUDGEMENT. And why does St.Paul worries about having divisions? Lets ask his Master. So please enlighten me, how could the Christian Religion (which according to you is synonymous to faith, but that's another story) be present in ALL DENOMINATION who does not agree with each other? How different is the Jesus of the Bible-believing Christians vs the Catholics? Very much. The true Jesus is the one clearly described in the Bible and not on stone or wooden man-made images. The Words of this true Jesus found in the bible is the true Word of life. The miracle of transformation comes from a person receiving rebirth from the Holy Spirit when genuine faith in Jesus as Lord and Savior is found in the heart of a repentant person. By faith he is washed of his sins through the atoning work of Christ alone. He stands justified apart from religion by his faith in Jesus alone. The promised of eternal life is to those who believed in Jesus alone. The Jesus of the Bible who says he is the way the truth and the life and no one comes to the Father except by him alone is the Jesus of the Bible believing Christians. Is this different from the Catholic Jesus? The only heresy is setting aside the commandments of God for the sake of man-made traditions. It is even apostasy to propose other means whereby a person may access God. God's glory is fully displayed in his Son, why add more channels or red tapes to God? All these truths are in the Bible, plain and clear and requires very little interpretation because God made it clear to us so that we may come to Jesus and be saved. So why must we read it with a closed heart and let others interpret it for us? It's like here's your food but let me chew it for you first! I really don't understand why anyone would say read the Bible but try not to understand it? That's duplicitous. What justification the church has now for the murders from the 11th to the 17th century of those people who found the joy of the love of God through the Bible whose only sin was reading it despite the ban by THE CHURCH? Is this Christ's commands when he said know me? How can anyone say they are of God but so adamant to refuse the truth of God and prevent others from enjoying God forever, whereas God is so accessible through Christ? Until the Roman church comes to terms with centuries of departure from the foundations of truth that comes from the pages of the Bible, and sees itself upholding Biblical truth rather than suppressing it, the Reformation will be the voice in the wilderness crying out to the apostate church, in hope that the conscience will be awaken and people will desire God more than just mere church membership, then the true believers will continue to gather where the glory of God is unveiled and he is worshiped in Spirit and in truth. Why then the fear when someone read the Bible and found out the true way of salvation that will inevitably lead them to leave the Roman church? Isn't it always the case? Because after reading the true Scripture and pondering it to the heart one will easily see that the Roman Jesus is a different Jesus whom the faithful will does not recognize and they will inevitably come over to the Jesus of the Bible, the Lamb of God who is in heaven now who himself is interceding for the saints on earth and will soon come again and overthrow all falsehood and smite the earth in judgment for all of those who suppress the truth and exchanged it for a lie. Romans 1:16-32. Read your Bibles and ponder upon it. Pacquiao is moving closer to the light of the world. This is a good thing. God is pleased. For the Kingdom of God belongs to those who thirst and hunger for righteousness. Jesus is his only hope from his wretched sins, not even his church membership can save him from that. Therefore do not put stumbling blocks along his way if anyone say they are of God. My dear Theophilus, tell me, how did we EVEN GET THE BIBLE IN THE FIRST PLACE? And may I comment on what you wrote: "Jesus is his only hope from his wretched sins, not even his church membership can save him from that. " So, Manny Pacquiao does not even need to be a member of that DAMN BORN-AGAIN CHURCH who is only after Manny Pacquiao's money and not the salvation of his soul. Just using your own reasoning. Ahehehehe, enter to the rescue naman agad etong si Theophilus para sa kanyang mga Protestant brothers. Theophilus your post JUST SMACKED the post of your fellow protestant Reojie. For Reojie, you can still be a Christian even if you are Catholic. Your very loooooong discourse obviously says NO. As the words of our Lord said, a house divided upon itself WILL NEVER STAND. I already had brother. And it says two important things. First, that I was redeemed through Jesus' blood. Second, that this Precious Blood was spilled for a church, God's church. Take heed to yourselves and to all the flock, in which the Holy Spirit has made you guardians, the church of the Lord, which he obtained through his blood. Acts 20:28. So my next question is, WHICH CHURCH? That is where history creeps in. And my dear Theophilus, I bet you will not like what you will learn. kadong, sorry if you seemed scandalized but before your react kasi, read the exact meaning of the word. FYI. Damn has been used in the Bible so many times. The online dictionary on the meaning of "damn"
Just providing info on the stipulations above. Ako po ay dating katoliko pero sa buong buhay ko ay hindi ako nakapagbasa ng bibliya...naging drug user ako at nasira ang buhay ko pati ang pag-aaral ko. Subalit minsan ay binasa ko ang bibliya at kumilos ang Diyos sa akin buhay. Binago Niya ako at ako'y nag-aattend na sa Born Again at hanggang ngayon ay hindi ko ito pinagsisihan dahil nakilala ko ang tunay na Diyos ng bibliya. Wala pong relihiyon ang makakapaglitas sa atin gaya ng katoliko, iglesya ni Kristo at iba pa kundi ang ating pananampalataya kay Kristo. Kapag sumampalataya tayo kay Kristo ay kasunod nito ay pagsunod sa mga aral ng bibliya. I'm sorry to say po Kadong na faith ninyo sa black nazarene ay hindi ito ang tunay na Jesus na itinuro ng bibliya...galit ang Diyos at ayaw niya ang mga rebulto (magbasa po kayo ng bibliya). May nagsabi din na ang itinatag ni Kristo sa ibabaw ng Bato na Iglesiya ay ang katoliko...mali po ito dahil ang Iglesiya po na sinasabi ng bibliya ay mga tao na sumampalataya kay Kristo, sila ang bumubuo ng Iglesiya. Huwag po sana tayong maging relihiyoso o die hard sa ating relihiyon dahil wala dito ang ating kaligtasan kundi na kay Kristo lamang. Salamat po! binagoNiyako, I thank God first of all that he changed you, he stopped you from being a drunkard. But what surprised me is your wrong view of what the Bible really is. Ask your pastor how the Bible came to be. Frankly, you are using the Book that the Catholic Church gave to the world. Your pastor just picked up a Bible and began to claim that he teaches the right thing. Christ did not intend it to be as He said "Go into the whole world and PREACH the Gospel to all nations baptizing them in the name of the FATHER AND OF THE SON AND OF THE HOLY SPIRIT." Did you pastor obey the commands of Christ in the Bible of baptizing you in the name of the Father and of the Son and of the Holy Spirit? Then your church itself is the first one to violate what Christ commanded. Christ did not intend his Church to be fragmented. He founded only one Church which He left to the care of Peter and his successors the Popes when He said "I give you the keys to the kingdom of heaven...Feed my sheep, feed my lamb." He did not even write the Bible nor did He command His apostles to write the Bible. Did He even say that we follow the Bible? Where is that in the Bible? I hope your way back home binagoNiyako. You are a lost sheep that the Good Shepherd wants to bring back home. REBULTO NA NAMAN. MY OH MY. wala na bang masasabi ang mga protestante sa aming mga katoliko kundi ito age old very very very very very very old na isyo regarding rebulto. haaaaaaaaaaaayzzzzzzt. Pinoy Catholic...im sorry to say pero ang ipinaglalaban nyo ay doktrina ng katoliko kaya hindi po tayo magkakasundo niyan. Basta ang paniniwala ko po ay nasa bibliya at hindi sa isang doktrina ng isang simbahan. God bless u po! When you talk about salvation and about the Bible, you are talking about doctrine my friend. And please be reminded that the Holy Bible came from a Church, which is called the Catholic Church, the only church founded by Jesus Christ, with an unbroken line from Peter and the Apostles until today with Benedict XVI shepherding. I will pray for your way back home. Uhm binagoniyako, sabi mo ang mas pinaniniwalaan mo ngayon eh ang doktrina ng bibliya. Pero sa dalawang post mo, di ka naman nagsisite ng verse sa bibliya. Sir TPC i thought the Protestants pride themselves of using the Bible and the Bible alone to support their beliefs and yet we have here protestants who haven't site a single verse in the Bible. Hay. They said that we need to follow the Bible, the Bible tells them to go to a church. And for them the Bible and the Church are at odds with each other. Weird weird protestants. Ah eh kadong, ilang post na kaming hindi nag papaligoy ligoy. Jesus wasn't a catholic, so why are you people convincing people to be a catholic? That's why we are called Christians because we are followers of christ! Not followers of religion,figure worshipers,saint worshipers or even pope worshipers! Christians worship jesus christ from our mind,body,and heart. Meaning we do what jesus suppose to be doing which is preach the gospel to the world. You don't have to holy and become a priest or nun, all you have to do is accept jesus christ as your lord and saviour and follow what the bible says. We are all sinners! That means even the priests,nuns,popes,pastors. EVERYBODY! that's why jesus christ died for our sins so we can have relationship thru GOD! Jesus is the only way to GOD! You alone cannot enter the kingdom of heaven without JESUS CHRIST the son of GOD! "Jesus wasn't a catholic, so why are you people convincing people to be a catholic?" Really gave me a brain freeze. Uhm, MP are you even aware that the word "Christian" was not used by the apostles nor the disciples to refer themselves? It were people from Antioch who first coined that term. And that term was used to separate them from the Jews. ERGO the term "Christian" was used to them because they are not followers anymore of the Jewish Religion. Obviously MP, you know VERY LITTLE of Church History. According to you...Christians worship jesus christ from our mind,body,and heart. Uhm, thats a complete CONTRADICTION from what the Lord tells us to do. Not unless MP you could explain to me philosophically or theologically that the SPIRIT is the same with "mind, body and heart"
SO....you know little of Church History and you know little of the FAITH YOU CHOSE. A little knowledge...IS VERY DANGEROUS. Little Tarcisius Yes WORSHIP HIM IN SPIRIT and IN TRUTH.,. what is the TRUTH? It is the WORD of GOD.,. which is WRITTEN in the BIBLE,. As it is also written, "NOT BY MIGHT, NOR BY POWER but BY THE SPIRIT of GOD".,. we should not rely on our OWN UNDERSTANDING nor INTERPRETATIONS.,. rely to what GOD says in YOUR HEART.,. I BELIEVE RIGHT NOR, HE IS KNOCKING in the DOOR of YOUR HEART!!! SOFTEN YOUR HEART.,. LET US HUMBLE OURSELVES BEFORE GOD and ADMIT THAT WE ARE NOTHING W/O HIM,. So kinalumatan mo na agad yung spirit at nanggigil ka na lang dun sa word na "TRUTH"? Chop chop the verses and see what will suit me huh. Truth=word of God=written in the Bible. But if I tarry long, that thou mayest know how thou oughtest to behave thyself in the house of God, which is the church of the living God, the pillar and ground of the truth. 1 Tim 3:15, panu yan Sir Armstrong, sa Church pala matatagpuan ang truth at hindi sa Bible. rely to what GOD says in YOUR HEART-san mo na naman nakuha yan? saka di ba sa kinontra nung pangalawang statement yung una? Again, a house divided by itself will never stand. sinabi ba ng bible, pick the bible, read it, and interpret it according to what your "heart" will say. Wala ata akong nabasang ganon. But i have read this. See, the Ethiophian was use not to simply "follow" his heart, he searched for someone, AN APOSTLE to guide him. Humble ourselves to God, if humbling means dropping my defense and agreeing to your OWN INTERPRETATION of the BIBLE. thanks....BUT NO THANKS. AND....FOR THE NTH TIME...WERE DID YOU GOT YOUR BIBLE? @kadong: Hindi daw nanghihingi ng donasyon yung mga pastor ng "born-again"? Antay-antay lang siya. Umpisahan yan sa "tithes" (10% ng income automatic i-oofer sa bulsa ng pastor, este, sa "church" pala nila. Imagine kung may 5 million USD si Pacquiao sa isang boxing match, obligado siyang magbigay ng 500 thousand USD, multiply that amount by 43 equals 21,500,000 Pesos! TIBA-TIBA ANG MGA EREHE!!! ); liban pa yon sa offering kada church service, tapos sunod na yung mga "sponsorship" sa mga "church activities" at "missionary work", etc. If Mr. Pacquiao thinks hindi na mababawasan ang yaman niya sa pagsama niya sa kultong ito, well he's in for a BIG surprise. 1. What is your evidence that being Catholic and Christian are two different things? 2. What is your evidence that we worship the "figures", "saints" and (ROFL) the "pope"? 2. Where does it say in the Bible that "all" you have to do to be saved is to just "accept jesus as...lord and savior"? 3. You say that one doesn't "have to [be] holy", then why did God command: "but like as he which called you is holy, be ye yourselves also holy in all manner of living; because it is written, Ye shall be holy; for I am holy." 1 Peter 1:15-16 (ERV)? My goodness, what you wrote is so...so...FLABBERGASTING. It reflects your ignorance of History, Catholicism, and even SCRIPTURE. If that's the summary of your faith and beliefs as a "born-again christian", then I am so thankful I'm Catholic. FYI. Read Genesis 28:20-22, Leviticus 27:30-33, Deuteronomy 28:1-48, Malachi 3:8-10.. PARA MALINAWAGAN.. Religion and Jesus are separate. Katoliko ako dati. Wala akong sinusundan na relihiyon. Si Jesus Christ lang. Isa lang ang Bible. Merong sariling Bible ang Catholic. Being religious won't save a person. Being good won't either. Jesus saves. Siya lang ang way, truth, and life (John 14:6). I respect Mother Mary that she conceived Jesus pero hindi dapat siya e-worship. God is a jealous God. There is only One Father, hindi taong pare. Saints aren't needed to intercede for our prayers... Si Diyos lang (1 Timothy 2:5). Although some Catholics are SAVED they're still stuck in between a religion and Jesus. Religion says "DO" while Jesus says "DONE" (John 19:30). gknow, how did you get your Bible? How did the WORLD get the Bible in the first place? The Muslims said that their holy book, the Quran, came down from heaven and was given to Mohammad. How about our holy book? Eh the rich man was nagpapasikat, Master I have done all of those things already, Jesus answered, SELL ALL YOUR THINGS, GIVE THEM TO THE POOR AND FOLLOW ME. MR.GKNOW THAT IS ALREADY A CHUNKFUL OF DO'S!!!! The verse that you quoted John 19:30 refers to the consummation of the mission of Christ here on earth. Its his work that he is referring to and NOT THE WORK THAT YOU ARE SUPPOSED TO DO. And hey, saints aren't needed to intercede for our prayers, ABA MAY DAPAT IPALIWANAG TONG ANGHEL NA TO. "[An] angel came and stood at the altar [in heaven] with a golden censer; and he was given much incense to mingle with the prayers of all the saints upon the golden altar before the throne; and the smoke of the incense rose with the prayers of the saints from the hand of the angel before God" (Rev. 8:3-4).What are the prayers of this saints? Can't one of those saint's prayer be a prayer of a friend? AT BAKIT KAILANGANG ITONG ANGEL PA ANG MAGDALA NUNG MGA PRAYERS...BAKIT DI NA LANG DIREKTA KAY JESUS!! @gknow: "Mother Mary that she conceived Jesus pero hindi dapat siya e-worship." Do you have EVIDENCE that the Catholic Church WORSHIPED (gave honor that is due to God alone) the Most Blessed Mother at ANY point in its history? "There is only One Father, hindi taong pare." Were I to use your logic then Christians are forbidden to address their male progenitors as "father". In the same Bible verse the Lord also says "Nor are you to be called 'teacher,' for you have one Teacher, the Christ." Matthew 23:10 (NIV). What do we call our school instructors then? "Saints aren't needed to intercede for our prayers... Si Diyos lang (1 Timothy 2:5)." God himself INTERCEDING... for whom and to WHO?! Last time I checked HE is at the receiving end of one's prayers...ROFL! But more importantly, could you show any Bible verse where it is forbidden for Christians to pray for one another? "Kaya mga ibang tao ngayon pinipiling hindi mag simba dahil kailangang maayos ang pag soot ng damit, huwag mag chew ng gum, malinis..? Hindi.. Jesus accepts anyone and everyone into His church!!" Have you read the parable of the Wedding Feast (Matthew 22:2-14, NIV): "But when the king came in to see the guests, he noticed a man there who was not wearing wedding clothes. He asked, ‘How did you get in here without wedding clothes, friend?’ The man was speechless. Then the king told the attendants, ‘Tie him hand and foot, and throw him outside, into the darkness, where there will be weeping and gnashing of teeth.'.." When you go to your so-called "sunday service", do you wear shorts, sandals, and basketball jerseys? Or do you wear decent clothes fit for the occasion and place? "For you are saved by GRACE through faith, and this is not from yourselves; it is God’s GIFT— not from WORKS, so that no one can boast." - Ephesians 2:8-9"
And THIS: "What does it profit, my brethren, if someone says he has faith but does not have works? Can faith save him? If a brother or sister is naked and destitute of daily food, and one of you says to them, “Depart in peace, be warmed and filled,” but you do not give them the things which are needed for the body, what does it profit? Thus also faith by itself, if it does not have works, is dead. But someone will say, “You have faith, and I have works.” Show me your faith without your works, and I will show you my faith by my works. You believe that there is one God. You do well. Even the demons believe—and tremble! But do you want to know, O foolish man, that faith without works is dead? Was not Abraham our father justified by works when he offered Isaac his son on the altar? Do you see that faith was working together with his works, and by works faith was made perfect? And the Scripture was fulfilled which says, “Abraham believed God, and it was accounted to him for righteousness.” And he was called the friend of God. You see then that a man is justified by works, and not by faith only. Likewise, was not Rahab the harlot also justified by works when she received the messengers and sent them out another way? For as the body without the spirit is dead, so faith without works is dead also." James 2:14-16 (NKJV). There is no more explicit and eloquent argument against the heretical belief that faith ALONE saves than the words of the Apostle Saint James, cousin of the Redeemer. No wonder the Antichrist Martin Luther wanted this Book SCRAPPED from the Bible. “Relationship, not Religion.” Sorry, OVERRULED by Saint James. Please refer to above paragraph. @gknow: What you posted is so overflowing with FOOLISHNESS that it’s MIND-BOGGLING. Naku, kung ganyang klase din lang paniniwala ang gusto mong ialok sa amin, SALAMAT NA LANG. Kainis ka naman MArtin, you already told them the verse that I gave them as an assignment. hehehe. hahaha katawa tawa ung iba... anu daw un tarcius? rebulto? hakhakhak..
ung mga Born Againd2 sa Pinas? This "dialogue" with these protestants is quite tiring. I'll just follow the owner's "style" and won't post any counter arguments anymore to the arguments thrown by these so-called Bible Christians (who ironically use less bible verses in supporting their beliefs) not unless they answer a question that was posted by the blog owner. So please, could someone from those irate protestant viewers give a straight answer to Sir TPC's question. HOW DID YOU GET YOUR BIBLE? Clue: the answer is not National Bookstore. "Lahat ng taong miyembro ng mga ibat-ibang sekta s kristiyano (Catholic, Born again, Baptist, etc.) ay maliligatas basta isabuhay ang aral ng Diyos." Sa Iglesia Katolika, si San Pedro ay itinalaga ng Panginoon na puno ng mga alagad at ang mga humalili sa kanya bilang Obispo ng Roma ay ang pinakamataas na otoridad ng Iglesia dito sa lupa, hindi kinikilala ng mga protestante ang aral na ito. Sa Iglesia Katolika ang tanging may karapatang magpaliwanag ng Bibliya ay ang Iglesia; sa protestantismo, kahit sino. Sa Iglesia Katolika ang tinapay at alak ay nagiging TUNAY na katawan at dugo ni Kristo sa Santa Misa, hindi rin kinikilala ng mga protestante ang aral na ito. Sa Iglesia Katolika, nagtatag ng Iglesia si Kristo na siyang dapat aniban at sundin ng sinumang gustong maligtas, at siya lamang ang tunay na relihiyon; sa karamihan ng mga sektang protestante hindi itinuturing na gawang ikaliligtas (necessary for salvation) ang pag-anib sa relihiyon at iglesia - sapat na ang "personal na relasyon kay jesus" (small letter j in "jesus" intented). Sa Iglesia Katolika, pananampalataya AT gawa ang nagpapaging-dapat sa isang tao, sa protestantismo, pananampalataya lamang. Sa Iglesia Katolika, itinuturang na isang mabigat na kasalanan ang paggamit ng kontraseptibo. Sa protestantismo, hindi. Maraming pinagkaiba sa aral, istruktura at disiplina ang mga sektang protestante at ang Iglesia Katolika. Tanong: Sino sa kanila ang may "aral ng Diyos"? Kung magkaiba ang paniniwala at aral nila sa isa't isa, paano silang parehong naging tama? Paano makapagliligtas pareho ang mga paniniwala at prinsipiyo na magkakasalungat? Sa simpleng lohika pa lamang hindi na tatayo ang paniniwalang iyan, paano pa kaya pag sinuri sa aral ng Bibliya? eto si manny nangangaral sa abs-cbn christian fellowship at sa mga kaparian sa katoliko church. according to him born again siya in spirit as required by the bible kaya marami nagsasabi na born again christian talaga siya. but previously he said "christian catholic" siya. i am not sure kung nagsisimba pa siya sa simbahang katoliko or kung naniniwala pa siya sa traditions ng simbahang katoliko. pero ang sure is parati siya daw nagbibible study sa bahay nila at sa mansion nila i think presided by a pastor. from what i understand, at its core, bible plus tradition = Roman Catholic. from manny's actions however, it seems he is more inclined to be guided by the bible based principle only. sa admi lang po ng blogs na to siguro its better to research and study will to answer every quistion in the post... kasi po sa totoo lang ang labo ng manga kasagutan at paliwanag ng admi nitong blog site, wala halos akong maintindihan at wala naman halos supporting verse, kung may support verse man mali naman ang pag ka paliwanag.. hay naku medyo nahihiya na rin ako sa ibang relihiyon na nakapasok dito sa sa blog site na to, mas m,agaling pa yata sila mag expose ng faith eh.. at mas niintindihan ng bumabasa..
Oh my dear Santi. I post the comments of those from other religions to show to them the shallowness of their views. If you think that they are that great. Why don't you answer this. WHICH INSTITUTION GAVE THE WORLD THE BIBLE? to all catholics, we are the first na naging born again , kungg pagaaralan ninyo lang ang pananiblia sampalataya ninyo bilang katoliko... si manny ang pinagmamalaki nating katoliko na sinasagawa ang pananampalataya, bakit born again lang ba ang may kasing galing magpaliwanag ng biblia? maraming katolikong nagaaral narin ng biblia subalit mahalaga ang witnessing , pagsasabuhay. dapat talaga kung ipinagmamalaki ni manny na siya ay katoliko , magaral pa siya ng pananampalataya ng katoliko... ang rrots natin si Jesus at ipinasa Kay San Pedro at sa Banal na Papa kaya we should be united and if Manny now was changed we all rejoice and also follow his sharing to read and practice what we read in the bible. To use this gem of an expression I learned while reading the comments in another Catholic site (I can’t remember for certain which one though), “born-again catholic" is an oxymoron acceptable only to, well, MORONS. If you are Catholic it is understood that you are already born-again, not by raising your hand and proclaiming that you "accept jesus as personal lord and savior" (which doctrine, ironically, CANNOT be found in Scripture), but by virtue of Holy Baptism: “…Jesus answered, and said to him: Amen, amen I say to thee, unless a man be born again, he cannot see the kingdom of God. Nicodemus saith to him: How can a man be born when he is old? Can he enter a second time into his mother's womb, and be born again? Jesus answered: Amen, amen I say to thee, UNLESS A MAN BE BORN AGAIN OF WATER AND THE HOLY GHOST, he cannot enter into the kingdom of God.” John 3:3-5 (DRV) This “rebirth” is accomplished by immersion or pouring of water while saying the formula given by our Lord himself as he ascended into heaven: "I baptize you, 'IN THE NAME OF THE FATHER, AND OF THE SON, AND OF THE HOLY SPIRIT.'" (Matt. 28:19). THAT is the moment a person dies with Christ and rises with him again (Romans 6:4), THAT is the moment he gains his birthright as a child of God and citizen of heaven (Galatians 3:26-27), THAT is the moment a person is considered a new creation (2 Corinthians 5:17), not through some waving of hands and mumbo-jumbo invented by these modern-day Simon Maguses who have the gall to call themselves "pastors". From what I see in the news reports it is clear as daylight that Mr. Pacquiao has already apostatized. Instead of studying the Catholic faith with the same diligence he gave to some of his lesser endeavors like boxing, academics and politics, he allowed himself to be deceived and led astray by a heretic, a servant of Satan: Jeric Soriano. It seems he just swallowed whatever was thrown at him, hook, line and sinker – as long as Mr. Soriano can come up with Biblical references no matter how convoluted and out of context they may be. Has he forgotten that it was through the prayers of his mother, uttered in front of a CATHOLIC home altar, and his own, uttered in the boxing ring with Our Lady’s Rosary around his neck that preserved him from danger and gave him the victories whose fruits he now enjoys? And this is how he shows gratitude to Our Lord and Blessed Mother for these great graces? Instead of the sweet yoke of Christ in the Catholic Faith he chose the happy-go-lucky beliefs of these deceivers. I tell you, such ungratefulness will NOT be without its consequences. From what I see in the news, payback has begun. By the way, let me say this in all candidness: Mr. Pacquiao is ONE LOUSY PREACHER. He is merely parroting his mentor in the same way the “pastors” of the JIL pseudo-“church” parrot their HIBANGELIST Eddie Villanueva even to speaking style and diction. Pero iharap mo siya (Pacquiao) sa isang member ng CFD-Davao (highly praised by Mr. Michael Voris), and without a doubt he will experience his first “knockout”. In the field of Theology and Apologetics, that is. Una, sabi mo wala halos “supporting verse” na binibigay kami dito to support Catholic teachings, eh tignan mo yung mga sinulat ng mga erehe dito, puro satsat lang samantalang kami ay BIBLICALLY BASED AND/OR BIBLICALLY COMPATIBLE. Alam kasi namin ang tamang lugar ng Bibliya sa TUNAY na Kristiyanismo, alam namin ang Biblia, alam namin ang kasaysayan kaya alam naming sagutin ang mga paratang at maling aral ng mga huwad na samahang ito. Tignan mo na lang, halos lahat ng mga “born-again” at mga sympathizers nila na nagpost dito nagsasabing dapat “tanggapin si jesus” o “personal relationship with jesus” para maligtas, pero wala naman ibinigay na na pruweba mula sa Bibliya para sa mga turo nilang iyon. Bakit? DAHIL WALA NAMAN TALAGA. Minsan hindi na kailangan ng malalim na Biblical exigesis para malaman mong mali ang sinasabi nila, halimbawa: ayon sa mga ito “hindi kailangan maging member ng church para maligtas.” Eh ganun pala, bakit pa nagtayo si Kristo ng Iglesia (Matt. 16:18) at bakit niya ito tinubos ng kanyang sariling dugo (Acts 20:28) kung hindi naman pala kailangan ito para ikaligtas? Sino ang mali kung gayon, si Kristo o ang mga ereheng ito? MALINAW PA SA SIKAT NG ARAW, MALI ANG ARAL NG MGA “BORN AGAIN” (KUNO) NA ITO. At kung mali sila sa ganyang kaimportanteng doktrina, ibig sabihin, SILA AY HUWAD. SILA AY HINDI KAY KRISTO. ITS THAT BLOODY SIMPLE. O sabihin mo ngayon sa akin, ano ang malabo diyan sa mga sinulat ko para pasubalian ang ang mga kaululan (foolishness in English) ng mga SINUNGALING na iniidolo mo? Mali ba para sa iyo ang mga sagot namin because you can provide a more concise and orthodox answer o DAHIL HINDI KA NAMAN TALAGANG NANINIWALA NA ANG MGA TURO NG IGLESIA KATOLIKA AY MAKA-BIBLIYA? Palagay ko doon ka sa pangalawa. Sana, sa halip na magpanggap kang Katoliko eh inilahad mo na lamang ang sa palagay mo’y tamang aral, at nang ika nga eh “masentensyahan”, hehe. “…We should be united and if Manny now was changed we all rejoice…” Tanong: Nagbago ba talaga si Mr. Pacquiao? I don’t think so. He may have stopped abusing alcohol and gambling (things which he could have done a long time ago in obedience to the age-old teachings of the Catholic Church) but in becoming a member of this heretical sect which exist in the spirit of lucifer’s “non-serviam!”, out of rebellion to Christ’s will that men be saved by becoming members of HIS BODY, the CATHOLIC CHURCH, I daresay that he has gone from bad to INFINITELY WORSE. To all my dear Friends, Brothers and Sister in Christ, I encourage you to pray before you post a comment on this site. Better to act as you read the Bible than to defend your faith which more shows "the acts of the flesh". I tell you, GOD created us with peace but because of Man's own wisdom, we have been disunited and have quarrel. I like the principle of Sir KADONG. He really shows what a Catholic should be. Yes, I am a BORN AGAIN CHRISTIAN. I was a Catholic before. Until I learned to have vices and cursed GOD because of the happening that I have experienced in my life. But by His mercy, GOD put me in a ministry where I know that HE IS A FORGIVING AND LOVING GOD. HE IS GOD ALONE. WE ARE CREATED BY ONE GOD. PLEASE STOP ARGUING BY YOUR OWN PRIDE. BECAUSE PRIDE IS THE GREATEST FACTOR THAT RESULTS DISUNITY. THERE WILL NO ONE OF YOU WILL WIN, BUT SATAN REJOICES BEHIND IT. JUST BE HUMBLE BEFORE GOD. PEACE BE WITH US, IN THE NAME OF OUR LORD LORD JESUS CHRIST. Don't imagine that I came to bring peace to the earth! I came not to bring peace, but a sword.MATHEW 10:34. You said that Kadong is WHAT A CATHOLIC SHOULD BE. WHAT? REALLY? You are a Protestant sir, HOW WOULD YOU KNOW WHAT A CATHOLIC SHOULD BE? What will be your criteria? Maybe in your "world" a Catholic must be docile, meek, and will not spark any argument to defend his faith. NO SIREE. As Catholics we are called to " Always be prepared to give an answer to everyone who asks you to give the reason for the hope that you have." 1 Peter 3:15. Oh and I have a curious question WHERE DO YOU FIND IN THE BIBLE THAT WE ARE CREATED BY GOD WITH PEACE? Dapat lahat ng paniwalaan nasa Bible right? Sang part mo nakita yon? I am not saying na wala, baka nga kasi meron. Kaya sige nga ipakita mo sa akin kung saan makikita yon. And who says we are here answering you and your protestant brethren "to win". As Catholics, we believe that Conversion is the job of the Holy Spirit. We are not answering here to "win an argument"? Again, you are judging my dear friend. ARGGGG. Napasagot na naman ako dito sa post na to. BALIK NA KO SA TANONG KO (AT NI SIR TPC) NA NAKOPO WALA PANG SUMASAGOT HANGGANG NGAYON. WHERE DID YOU GET THE BIBLE!!!????!!!! I was doing a bit of reading on the claims that the Catholic Church gave the world the Bible....here are the points. "If she had not scrutinized carefully the writings of her children, rejecting some and approving others as worthy of inclusion in the canon of the New Testament, there would be no New Testament today. "If she had not declared the books composing the New Testament to be inspired word of God, we would not know it. "It was the Catholic Church and no other which selected and listed the inspired books of both the Old Testament and the New Testament...If you can accept the Bible or any part of it as inspired Word of God, you can do so only because the Catholic Church says it is." (The Bible is a Catholic Book, p. 4). Say I agree to the points above, does this really profit anyone ? Shouldn't the more appropriate question be ; Who follows the Bible, rather than who gave the Bible to the world ? I don't mind being called a catholic as long as that is what the scripture says..but what does the scripture say really ? "Shouldn't the more appropriate question be ; Who follows the Bible, rather than who gave the Bible to the world ?" Here are two questions for you, Davy: 1) For around three hundred years after the Ascension of the Lord there was no "Bible", so how were Christians able to know and preserve the True Faith, especially through the Great Persecutions? 2) You said what was really important was that the Bible was followed; tell me, WHO decides whether or not what is written in the Bible is being correctly taught? Before anything else, may I know which one you consider to be the higher authority ? Is it the Bible or the Church Institution ? Fun ? You consider it fun lambasting people over this blog ? Wouldn't it be much better to explain your points on the premise of clarification and reconciliation rather than sarcastically pointing out the flaws of their arguments and having your "fun" with them ? @Davy: "may I know which one you consider to be the higher authority ? Is it the Bible or the Church Institution ?" That is WHY I asked you those two questions dear. Why don't you answer them first? It's quite easy, I assure you. First, you said it was not important who gave the Bible to the world, then tell me: in the three centuries before the CATHOLIC CHURCH gave the world the Bible, how did Christians know that the beliefs they held were correct? Second, you said that what is important is that the Bible is being followed, then: who has the final say as to whether or not what beliefs anybody holds is Biblical or not? So simple! If you had chosen to answer we could have gotten the ball rolling. "Fun ? You consider it fun lambasting people over this blog ?" Did I "lambast" you Davy? Why so touchy? And what is it to you if I consider the act of PROCLAIMING THE TRUTH OF THE CATHOLIC CHURCH and EXPOSING HERESIES FOR THE IDIOCY AND UTTER STUPIDITY THAT THEY REALLY ARE AS FUN? Because IT IS! If one is merely asking a question then they'd get a straight answer from me. But for those silly enough to assert heretical beliefs in a CATHOLIC BLOG, then WOE UNTO YOU. Remember that St. Paul didn't triumph over the sorcerer Elymas with "the premise of clarification and reconciliation". I am sorry Martin, I truly love the Bible. I am not a theologian, nor a historian. I am lowly person. But I do read a lot of references and there's basically nothing you can tell me that I can't find in the internet. This is the reason why I wanted to align first before we started talking. If you feel that the church has equal or higher authority than the Bible, then I rest my case. There's just nothing in common for us to start with. Rebuke, edification is scriptural. It's fine. But having "fun" ? Oh and Paul did triumph, but do you think he had "fun" ? Nope. I get the point. This is a catholic blog. Thanks for the time and I apologize if I offended you in anyway. This is my last post. God bless. "If you feel that the church has equal or higher authority than the Bible, then I rest my case. There's just nothing in common for us to start with. " Then you're simply not interested in TRUTH, Davy. To use the words of Eli Soriano (hehe), hindi ka nagtatanong, TUMATANONG ka. You're asking questions with preconceived, set-as-stone-into-mortar notions at hand and NOTHING will budge you from discarding them no matter what glaring Biblical and historical evidence I present to the contrary. That's the reason why you do not want to answer those two questions, that is why you chose to exit early on from this conversation. "But having "fun" ? Oh and Paul did triumph, but do you think he had "fun" ?" Maybe Saint Paul did. As for me, the knowledge that I am doing my part to defeat the kingdom of satan (which you and many others have built up with your errors) and bring about the triumph of the TRUE FAITH, the Catholic Church - THAT is EXQUISITE PLEASURE. Goodbye then, and may you be saved from the fires of hell due to your heresy. Alam mo, ISA KANG IPOKRITO. Halos umpisa pa lang ng pinost mo hinusgahan mo na ang pananampalataya namin: "Better to act as you read the Bible than to defend your faith which more shows "the acts of the flesh"". Then you call for peace and humility and unity?! Such brazen exhibition of two-facedness, its almost pornographic! I can’t help but think you have other objectives in asking that Catholics not to defend their faith, in the light of your description of our Church and your admission that you are an apostate, a heretic. “I tell you, GOD created us with peace but because of Man's own wisdom, we have been disunited and have quarrel.” Isn’t that a very apt description of the protestant heresy which you belong to? Does not every founder and member of the almost 30,000+ schismatic “churches”/”fellowships”/”ministries” on the face of the earth rely on his/her own wisdom to interpret Scripture, deluding themselves that they are aided by the Holy Spirit, when Scripture itself and History shows that there is only ONE LEGITIMATE INTERPRETER OF SCRIPTURE – THE ONE WHO COMPILED IT, THE ONE WHO DETERMINED WHICH BOOKS BELONG TO THE BIBLE OR NOT, THE CHURCH FOUNDED BY CHRIST (No, not your grotty, second rate, trying hard copycat “ministry”) - THE CATHOLIC CHURCH. Instead of submitting, they, like Lucifer out of pride rebelled (OO, SINASABI KONG SA PAGIGING MIYEMBRO MO NG HUWAD NA SAMAHAN NA IYAN, AY ISA KANG TIGASUNOD NI SATANAS. MASAKIT?). (continuation of previous post) “I was a Catholic before. Until I learned to have vices and cursed GOD because of the happening that I have experienced in my life. But by His mercy, GOD put me in a ministry where I know that HE IS A FORGIVING AND LOVING GOD.” Like Mr. Pacquiao, you (impliedly) blame the Catholic Faith for not helping free your life of vices, and you attribute your present “conversion” to your membership in those heretical sects. But let me ask you, when you were still Catholic and struggling with evil habits, did you frequent the Sacraments, especially Confession and Holy Communion, since the teaching of the Church and the testimony of countless faithful Catholics say that these two are the best deterrent for habitual sins (all sins, actually)? Did you engage in frequent prayer? Did you ask the intercession of the Blessed Virgin and one or two of the countless Saints of the Church, who are ever at the ready to assist you? NO. Instead, YOU BLAMED GOD, YOU CURSED HIM. You could have taken advantage of great, great graces from a FORGIVING AND LOVING GOD, accessible to you anytime you wanted it in order to improve your situation but YOU DIDN’T. Instead you joined the ranks of His enemies. Do you think your spiritual state (and Mr. Pacquiao’s as well) has changed? NO. SATAN SIMPLY STOPPED TEMPTING YOU TO THESE VICES TO CONFIRM YOU IN EVEN GRAVER SINS: HERESY AND APOSTASY. “PLEASE STOP ARGUING BY YOUR OWN PRIDE. BECAUSE PRIDE IS THE GREATEST FACTOR THAT RESULTS DISUNITY. THERE WILL NO ONE OF YOU WILL WIN, BUT SATAN REJOICES BEHIND IT.” No, Satan rejoices when faithful Catholics allow his minions to wreak havoc on the Church purchased by Christ with his own blood. This is not because of pride, this is because of the TRUTH. TRUTH entrusted SOLELY to the Catholic Church by her Founder, Master, and Redeemer, Jesus of Nazareth. TRUTH that countless Martyrs shed their blood for and numberless Confessors bore witness to with their lives. TRUTH that heretics like you treat so cheaply for one objective and motivation or the other. Truth that your false “church” (or ministry or fellowship) will never have nor comprehend no matter how you try. ZELO ZELATUS SUM PRO DOMINO DEO EXERCITUUM – Behold the motto of the Carmelite Order, taken from the words of the Prophet Elijah to the Lord God on Mount Horeb, after he proved before all Israel who is the True God and slaying all of the priests of the false god Baal: “With zeal I have been zealous for the Lord God of Hosts” (1 Kings 19:14). May every Catholic be found worthy to say these words for SPREADING and DEFENDING the Catholic Faith in words and deeds. Amen. hehehe... Friends, I'm not judging you. Maybe your own condemned you. hahaha... But what I can stand upon it is - my GOD is a living GOD. The creator of Heaven and Earth; the provider of everything to those who call His Name; the One who rescued me from my wilderness and turn my darkness into light; the One who sent His only Son to the world, to be crucified, for the sins of the world be forgiven; He is not made by human hands. I know that there will be an endless conversation in this page. But for me, the most important there is not always guard our church, but we must guard first the salvation that freely given by God to us through His Son JESUS CHRIST. It's not all about the denomination that we belong, but its all about to our relationship with GOD. Thank you for your words friends, hehehe... talagang immune na ako sa mga words na yan. I always encounter that in School and in any places. If you have really faith in GOD, you must know how to accept the persecution of the others. You must know to be humble. hehehe... "You can forgive to those people who hurt you, but more that this, forgive yourself why you are allowing them to hurt you". We, Born Again Christians, "We are not fighting against flesh and blood for that is not our struggle." May the PEACE be on this page, in the Name of the FATHER, to the SON, and to the HOLY SPIRIT. Amen. Oh beautiful, beautiful words, radzk153, like those spoken by the Serpent of Eden! Sorry to say, you stand upon NOTHING. You think God is with someone like you who chose to live in open rebellion against Him? You reject the Church founded by His only Begotten Son and think you are worthy of salvation? Oh please, stop deluding yourself. "If you have really faith in GOD, you must know how to accept the persecution of the others. " You are not being persecuted my dear, you are being CORRECTED, REBUTTED, AND REPROVED for spreading ERROR and STUPIDITY. Think that false humility of yours will work wonders here? Sorry, we are here for TRUTH, not theatrics. "We, Born Again Christians, "We are not fighting against flesh and blood for that is not our struggle." Eh yun naman pala, eh bakit PAAWA EFFECT lang dala mo sa giyera? Eh kasi NASA AMING MGA KATOLIKO ang mga tunay na SANDATANG ISPIRITWAL - ang KATOTOHANANG ITINURO NI KRISTO, ang Kanyang KATAWAN AT DUGO, ang KASI NG ESPIRITU SANTO, ang AMING KARAPATAN BILANG KAANIB NG TUNAY NA IGLESIA at TUNAY NA MAGA ANAK NG DIYOS. These are things that you lack and will NEVER have unless you repent of your error. "I know that there will be an endless conversation in this page." Of course. Catholics must NEVER have HERETICS and LIARS like you have the last say, lest you infect others with your disease. Friend, its better to show a drama that happened truly to a life of the one who act/speak that the one who says he's realistic but he did not know if what he did. Yes, thank you for your correction, thank you for the little judgment, and thank you for such information. Friend I'm not laughing because I act such a fool, but I laugh as a sign that I was not angry. Because you are not my enemy nor other Catholics. I'm not a liar, GOD knew that. If you said "false humility", is it bad not to angry? Friend, I don't want to have trouble. But again, I ask you, why there are some Catholics opposing your words here? Is it bad of being catholic to be a Christ centered? I encountered a lot of people who shown their faith of being catholic. They are very faithful to GOD. They do not want quarrel. In addition, what is your real purpose in creating this page? Is it because you don't want Sir Manny had been changed? why are you focusing to him upon the great change that he had? You know it is much better if you work as a catholic, as you boasted that you are child of GOD to work for a change of those other Higher people in the government, and in other aspect of our community so that we can achieve the transformation of our society. Because that was we are working about. Talking about "SANDATANG ISPIRITWAL", I tell you that when you have this you will not fighting against human but those spirits who hold the man to continue do bad. And the only one who can say that he is child of GOD, when he sure that he has a right relationship with GOD. Because seven me, I am not still a child/son of GOD when I committed wrong before Him. My last question is, about the practice of the Catholic. Did you know if what was happen at the 3rd period of Greek Literature when the Greeks became slaves of Romans and then the Romans became slaves of the Greeks in terms of Literary works? Study the culture of this two races. thank you and GOD BLESS. haha,. PAKYAW! BUMALIK KA SA PAGBIBISYO MO,. PINAG AAGAWAN KA na NG LAHAT,. lol,. pag nawala ang Mother Church(Catholic) sigurado magiging magulo n ang mga kristiyano. Libu-libo n ang mga sekta ng mga Christian religion s mundo at hindi sila nagkakasundo lahat sila sinasabing sila ang totoo, pero ang pinangglingan ng mga founder nila ay s Catholic. Halos lahat sila sinisiraan ang Catholic pero hindi sila nagtagumpay. Sa totoo lang mas biblical talaga ang Catholic,dahil Catholic ang bumuo ng Bibliya, kaylangan lang talaga maturuan ang mga miyembro.Sa dami kasi ng miyembro ng Catholic hindi n gaanong natuturuan ng husto. Halos lahat ng mga ibat-ibang Christian denominations ngayon gaya born again at protestants ay inspired lamang ni Martin Luther. "Friend, its better to show a drama that happened truly to a life of the one who act/speak that the one who says he's realistic but he did not know if what he did." That's EXACTLY what you have based your faith and your supposed "changed life" upon: DRAMA. UTTERLY WORTHLESS DRAMA. Not the TRUTH of CHRIST upon which the Catholic Church is built upon. Not the TRUTH of CHRIST which every Catholic must zealously defend. "Because you are not my enemy nor other Catholics." You are an enemy of TRUTH, not only for being a heretic but also counseling others to DO NOTHING, to be COWARDS, when lies against the TRUE RELIGION are being spread. "[In response to someone who begged him (Saint Pius X) to "go soft" on the Modernists, He retorted]: "Kindness is for fools! They want them to be treated with oil, soap, and caresses but they ought to be beaten with fists! In a duel you don't count or measure the blows, you strike as you can! War is not made with charity, it is a struggle a duel. If Our Lord were not terrible he would not have given an example in this too. See how he treated the Philistines, the sowers of error, the wolves in sheep's clothing, the traitors in the temple. He scourged them with whips!" Now, who will I follow, Christ and a Pope who is also a canonized Saint of the Church o kayong dalawang DUWAG ni Kadong? Aber?! “Is it bad of being catholic to be a Christ centered?” What you mean is, is it bad to be a Catholic and associate yourself in any way with a group in SCHISM with the Catholic Church and who rejects its teachings? Are you kidding me? Sorry my dear, ika nga ni Tandang Basiong Macunat: “Ang ongo (ogre), bihisan man ng baro at salaual, ay ongo pa rin.” Ang EREHE, ilang beses mang sabihing siya’y kaanib ng Iglesia Catolica ngunit ‘di naman itinatakwil ang maling paniniwala at pagkaka-anib sa grupong kumakalaban sa Tunay na Relihiyon, ay nanatiling EREHE, nanatiling KAMPON NI SATANAS. “I encountered a lot of people who shown their faith of being catholic. They are very faithful to GOD. They do not want quarrel.” How sure are you that Catholics who shy away from defending their faith and evangelizing non-Catholics are “faithful” to God? 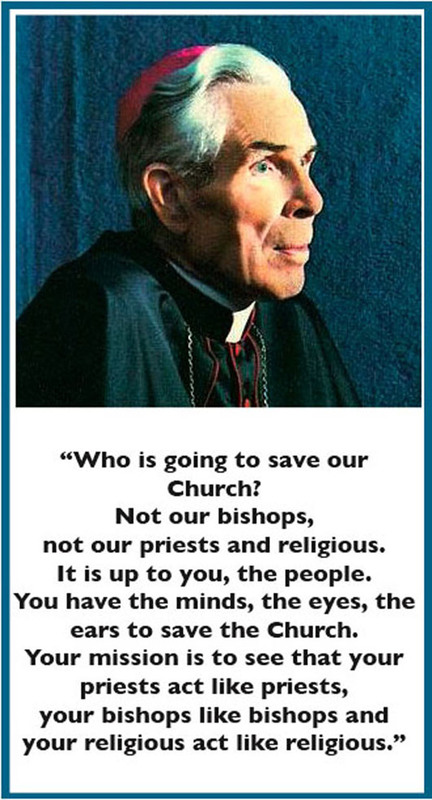 Here’s what the late great Servant of God Archbishop Fulton J. Sheen, has to say of these people: "A Catholic who does not strive to spread his faith is a parasite on the life of the Church." Sorry, the catholics whom you have so proudly held up as examples are NOTHING MORE THAN PARASITES LIVING OFF THE CHURCH OF GOD. (continuation of previous post) “You know it is much better if you work as a catholic…to work for a change of those other Higher people in the government, and in other aspect of our community so that we can achieve the transformation of our society. Because that was we are working about.” The Church IS working to keep Christianity in Government and Society, kaya nga sinasabihan na kaming “nakikialam” sa gobyerno e. Kaso isang pahirap sa amin (liban sa mga secularist at liberals sa lipunan) ay ang mga kagaya ninyong mga BULAANG RELIHIYON na ibinebenta ang mga boto ng kanilang mga miyembro sa mga pulitiko para magkaroon ng padrino sa pamahalaan. Halimbawa na lang yung isyu ng RH bill, yung mga grupong protestante eh sumusuporta dito, gaya ng HIBANGELIST na si eddie villanueva. Siyempre, ayos na ayos sila sa mga pro-RH. Alam ng Iglesia Katolika ang epekto “contraceptive mentality” sa isang lipunan, nagbabala na nuon si Pope Paul VI sa Encyclical Letter niyang “Humanae Vitae” na magiging daan ito upang bumaba ang moralidad pangsekswal ng mga tao. Ngunit ‘di sumangayon dito ang mga samahang protestante (ano pa ba aasahan mo sa mga kampon ng diablo?). At nagkatotoo nga ang babala ng yumaong Santo Papa, lalo na sa mga bansa sa kanluran. The Church is doing the work Christ commissioned it to do, kaya ‘wag MAKAPAL ANG MUKHA mo na paalalahanan kami kung ano trabaho namin, lalo’t na at KAAWAY ka ng KATOTOHANAN. “I tell you that when you have this you will not fighting against human but those spirits who hold the man to continue do bad.” A Christian will be fighting against BOTH, against evil spirits who inspire rebellion against God and His Laws, and humans who have chosen to rebel, and not only to rebel but also to lead others to rebel, and their lot will be those of the fallen angels whose lead they have taken: THE FIRES OF HELL. You are one of these people, radzk153. In your present spiritual state if you happen to die at this moment, you will be CONDEMNED TO ETERNAL DAMNATION. “My last question is, about the practice of the Catholic. Did you know if what was happen at the 3rd period of Greek Literature when the Greeks became slaves of Romans and then the Romans became slaves of the Greeks in terms of Literary works?” I know my History, that’s why I will NEVER be perverted to Protestantism. Pero ang dami mong kuskos-balungos. Why should I do your dirty work for you? Give a direct question about this matter and expect a direct answer from me (Sir TPC willing). Speaking of which: “In addition, what is your real purpose in creating this page?” Uh, ‘di po ako gumawa ng blog na ito. 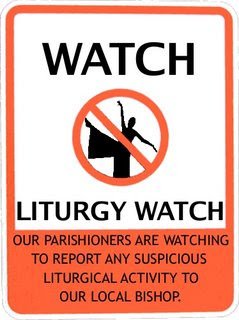 I am a follower of this blog who, like the creator thereof, is supremely irritated by liturgical abuse and watered-down Catechesis. Kindly give credit where credit is due, okay? Where can you find the statement above in the Bible? Angelo, the protestant heresy was doomed to fail from the beginning. Never united except in their hatred of Truth and the One True Church, multiplying like diseased bacterium, spawning one novelty after the other, departing further and further from Christ's teachings as time goes by. That is the fate of those who take into their own hands the authority that was given by Christ ONLY to the Catholic Church - the interpretation of Scripture. Pitiful. there's enough religion to divide us all.no priests or preachers can save our soul.it is only JESUS,my friends who can lead us to heaven.not the catholics or any churches.let me tell you this brothers/sisters ,get to know the living GOD and for sure you'll find peace.read the BIBLE ( i mean read by yourself not from any church leaders,grasp and put it into hearts.it is our responsibility to know GOD's words. )anyways,do what ever the CHRIST is telling you,Manny!GOD BLESS US ALL. Question: "What does it mean that Jesus is our High Priest?" Answer: High Priest is only one of the many titles applied to Jesus: Messiah, Savior, Son of God, Son of Man, Friend of Sinners, etc. Each one focuses on a particular aspect of who He is and what that means for us. In the book of Hebrews, Jesus is called a High Priest (Hebrews 2:17; 4:14). The word “priest” carries a couple of primary meanings. First, it means one who mediates in religious services. It also means one who is holy or set apart to perform those services. One other important point about Jesus' priesthood—every priest is appointed from among men. Jesus, though God from eternity, became a man in order to suffer death and serve as our High Priest (Hebrews 2:9). As a man, He was subject to all the weaknesses and temptations that we are, so that He could personally relate to us in our struggles (Hebrews 4:15). Jesus is greater than any other priest, so He is called our “Great High Priest” in Hebrews 4:14, and that gives us the boldness to come “unto the throne of grace, that we may obtain mercy, and find grace to help in time of need” (Hebrews 4:16 KJV). Agree Sir TPC, this post indeed is one of the most viewed. obviously they are calling more of their bretherens to go to this post to help them malign the Catholic Faith. Oh well, Sir Martin is already doing a great j0ob here. Oh isa sa mga napansin ko. IF a protestant could not throw any arguments anymore, he will always fall back to a. I am just a "humble" "lowly" man with out any knowledge of "history" and "theology". HAHAHA. What a LAME EXCUSE. So nangahas ka pang makipagdebate tapos dun lang din pala ang irarason mo. The reason you are STILL READING THIS THREAD AND REACTING TO THIS POST is simply because you BELIEVE THAT YOU KNOW SOMETHING THAT WE DON'T KNOW. SO quit falling back to that excuse. It's self refuting. the other thing i notice is b. in the end we are responsible for our own salvation. WELL got to admit I believe in that too. THAT IS A WAY MUCH BETTER MANEUVER THAT THE FIRST ONE. Kaya lang if that's the case pala...WHY POST HERE? We are responsible naman pala for our salvation so why need to convince Catholics to stop being Catholics. NAKO may eeksena i'm sure, uy di kami ganun, di namin sinasabi na kailangan mong itigil ang pagiging Catholic, ang mahalaga you must follow the Bible and accept Jesus as your Saviour. PLEEEEEAAAASEEEE. ITS PLAIN HYPOCRISY. Dear protestant brothers, YOU WANT AS TO LEAVE CATHOLICISM THE SAME THING WE WANT YOU TO LEAVE PROTESTANTISM, wag na tayong mag-utuan. That's all for now. KUDOS MARTIN!!! Di ko yata kaya ang patience mo brother. And gee, tagal ko ng di tinitignan tong thread na to, wala pa din palang nakakasagot sa tanong ni Sir TPC. Ang pinakamalapit na sumagot eh...it doesn't matter who wrote the bible blah blah blah. Kung merong tax evasion...meron ding palang TRUTH EVASION. hehehehe. I'm Catholic but since there are brethren who might like to label me, I really don't know how or what kind of Catholic I am. I like listening to Pastor Ed Lapiz and to Charles Swindoll; I have and read study bibles in the Protestant tradition: ESV-SB, NLT-SB, NKJV (by Max Lucado). Some of my favorite authors in my Catholic tradition are: Scott Hahn and Curtis Mitch who edited a great study bible for Catholics Ignatius SB- Genesis and NT. And for Catholic apologetics, for me nothing beats Radio Replies Vol 1-4 (Pre-Vatican II) by Fathers Rumble and Carty. That said, I owe it to my Protestant brethren who helped steer me back on the road to the Lord. It is through them that I rediscovered the bible and claimed back my own life which was being lost. We disagreed amicably on a number of issues (purgatory, Immaculate Conception for instance) since my authority on doctrine, faith and morals remain the Catholic Church. But I refuse to subscribe to the belief of some of my fellow Catholics that Protestants are doomed merely by being so. They will be saved. My proof? The official teaching of the Church itself: Catechism of the Catholic Church post-Vatican II Articles 817-819. If Manny Pacquiao becomes a born-again Christian, so be it. God bless him. Such is the power of the bible when one begins reading it. If it is God's will, then one day he will begin to question the authority of the bible, how it came to be and whether he can trust his own interpretation of the bible. One day when he encounters difficult passages, he will understand that he can't lean on what he decides the Spirit is telling him- for that would be leaning on his own authority. God is the One and Only authority. The problem is discerning what exactly the Holy Spirit teaches. Many times it's clear. Some times it isn't so clear. For example, is contraception biblical or not? Do you baptize when you're of age or as young as infants? Luther believes in the Immaculate Conception, C.S. Lewis a famous Anglican believes in purgatory, the Seventh-Day Adventists believes you can lose your salvation: all in direct opposition to the most cherished beliefs of other mainstream Protestant communities. So what's your belief on these matters? For that you have to rely either on your private interpretation (being your own bible teacher), your pastor's authority, or your Church's official teaching. Just a thought from a flawed Christian brother. TPC said: IF YOU WANT TO STUDY THE BIBLE AND STILL REMAIN CATHOLIC, TAKE IT FROM A CATHOLIC PRIEST, OK? Wow, this statement is really something. I can't help re-blogging this. Praise GOD Manny is a Believer(Born Again), Believer means only one GOD you know and that is JESUS CHRIST no more no less...John 14:6, Jesus answered, “I am the way and the truth and the life. No one comes to the Father except through me." And this is the diff. bet. Catholics and us (believer), no Saints involve only One GOD Jesus Christ. like in 10 commandments of GOD at 2nd - 2. Huwag kang sasamba sa mga diyos-diyosan. Sorry for the long hiatus, actually I was really hoping to find something more SUBSTANTIAL, something to CHALLENGE my intellect, from these protestant heretics when I came back but to my utter disappointment what do I find - tr29, a "catholic" who picks and chooses what to believe in much the same manner as someone trying to decide what to eat from the neighborhood carinderia. Wait, isn't THAT the very definition of the term "CAFETERIA CATHOLIC"? Haha! And he is so afraid of being labeled that he had to issue a caveat before stating his opinions. Oh well, why am I not surprised. Here's my own warning to you, tr29: expect the GARBAGE you posted to be dissected like a frog in anatomy class, ESPECIALLY your use of the CCC as reference. Now, who else shares in this comically tragic company of rebels against God and His Church? Ah, XtianPunk: If you were using your brains you wouldn't even think of joining one of the names of the True Religion (Xtian, an modern abbreviation of the word "Christian", X here used as the Greek letter chi, which in turn has been traditionally used as one of the letters of the Christograms [IC XC, or the P and X superimposed as the Chi-Rho] and the word "punk", described as a music and lifestyle movement based on anti-social, anti-establishment, nihilist and (!) NEO-NAZI principles, "[punks] expressed [their] views...[in the use of] "harder, more self-destructive, consciousness-obliterating substances like heroin, or ... methamphetamine" (Wikipedia). So much for your moral authority. Tsk, tsk. And tommy, a wee bit of fresh air (like a breeze from the Pasig River) with his Bible "references". Sadly, mukhang 'di ka nagbabasa. Nademolish na 'yang barong-barong na doktrina ng iskwater mong kulto namin ni Little Tarcisius. Scroll up ka muna bago ka magmukhang parrot. Puro kayo mga "testimony" (kung familiar kayo sa gimik ng mga "born-again" alam niyo tinutukoy ko), but you are NOTHING MORE THAN A BUNCH OF PERJURERS. Ngayon, I am giving the same challenge I gave Davy: 1) For around three hundred years after the Ascension of the Lord there was no "Bible", so how were Christians able to know and preserve the True Faith, especially through the Great Persecutions? 2) WHO decides whether or not what is written in the Bible is being correctly taught? Little Tarcisius: Bro., thank you for your kind words. We’re just keeping in mind the Lord’s warning, that "He who is not with me is against me, and he who does not gather with me scatters.” I’d hate to be counted among His enemies. According to the Latest News of Pacquiao, he was so busy last Sunday in his bible studies and bible sharing to others. Good to know that Pacquiao was able to do it as well as his practice in boxing. Studying? Oh please?! Most probably reading the Bible and memorizing whatever heretical interpretation provided by that son of satan Jeric Soriano so he could "share" it to others. Although I don't know how any could benefit from sharing garbage or poison, hehe. Palitan na lang na bible ambassador ng CBCP si manny. Manny's bible studies are presided and guided by his pastor mentor hence most probably not totally in conformity with the catholic teaching. it will create confusion specially that manny is preaching and is actively doing so anywhere he goes even to fellow catholics. I read from a news article before that he was already advised by a bishop to seek help of a priest for guidance in his bible studies but the advise was not obviously heeded. manny is patiently being discipled by multiple pastors including a former congressman pastor. "Matapos makalabas ng kulungan, nag-iba ang buhay ni Dennis, isa siya sa mga pastor ng boxing champ na si Manny Pacquiao. “I just pray na tuna 'yang conversion at mag-grow siya at sana dumaan siya sa process. Kasi kapag hindi siya dumaan sa process, it becomes dangerous,” sabi ni Dennis." i don't know lng poh ha? how much more the priest who studied the bible for 10years? I am a catholic but i dont agree that these pastors just want to share God's word to Manny because of his riches. Ako mismo naka experience ng mga born-again christians na lumapit sakin para mag share ng God's word at makikita ko sa kanila yung COMPASSION para sa mga taong kilala nga lang si Lord sa pangalan pero masasabi ko na dahil sa pagpapagamit nila kay Lord nagkaroon ako ng personal relationship sa Lord na hindi ko mahanap hanap dati sa Knights of Columbus! I never had this joy of having this salvation I can determine now that Im saved dati akong KOC at YFC pero umiinom nagmumura at masasabi kong wala akong personal relationship sa Lord noon mga kapatid ko mismo nakita ko ung pagababago sa kanila ng na born-again kami "BORN-AGAIN" for catholics and for Christians are so different for Catholics its just the binyag or "wisik", the sacraments like confirmation which is just a ritual NAGMUKA KA NGANG BANAL PERO WALA NAMANG NAGBAGO! pero sa TOTOONG KRISTYANO which is the BORN-AGAIN Christians and pagiging "born-again" ay ang pagiging bagong tao na mayroong relasyon sa Diyos at yung pagtanggap kay Hesus as your God & Savior. "I am a catholic..." Stop right there boy, TAMA NA ANG KAPLASTIKAN AT PAGPAPANGGAP. There is NOTHING authentically Catholic about you, just as there is NOTHING authentically Christian about this CULT that you have joined. Wanna prove me wrong? TRY ME. As usual, gaya ng mga kagaya mong nabrainwash ng mga BOBONG pastor ninyo, puro kayo drama. Idaan ninyo sa ARAL, at sa KASAYSAYAN, at sa KATWIRAN, at tiyak mapapahiya kayo. Kayo'y sumasama sa isang samahan na KUMAKALABAN sa Iglesia Katolika, at pinaniniwalaan ninyo ang kanilang mga aral na taliwas sa tinuturo ng Iglesia Katolika, pagkatapos ay ipinangangalandakan ninyo na kayo'y Katoliko? Anong KAULULAN 'yan?! Ika nga, if it looks like a duck, walks like a duck, sounds like a duck, then it must be a duck. To use a better analogy to refer to fake Catholics and closet protestants LIKE YOU, if it looks like sh*t, smells like sh*t, feels like sh*t, then it must be SH*T. You, @Unknown, sound like a protestant heretic, think like a protestant heretic, act like a protestant heretic, ergo, YOU ARE A PROTESTANT HERETIC! 'Wag kang DENIAL QUEEN! Maglaban tayo sa ARAL, hindi sa kadramahan! WALANG KWENTA ang kwento-kwento mo, ang tunggalian ay sa DOKTRINA! KAYA MO BANG SAGUTIN YUNG DALAWANG TANONG NA IPINOST KO SA TAAS PARA SA MGA EREHENG KAGAYAN MO? SAGOT! @Martin siguro yung unknown na yan ay isang baby Chritian palang. Okaya naman isang Katoliko na nashare-an ng isang Born again. Ingat lang tayo sa words natin kasi jan nakikita kung sino ka talaga. Hindi lahat dinadaan sa Intelktual na paraan kasi tayo mismo, hidni maabot ang Diyos sa Intectual na bagay. MABUTI na sasamahan ito ng WISDOM na nasa bible. Ang salvation walang pinipili, pero its up to us kung magiging humble ba tayo. Hindi ko alam kung sino sa atin ang na-uto ng mga pastor, pero tingin kolang meron isa sa atin ang naloko na ng pagkahambog. Be humble kapatid. Ako, ikaw at siya ay hidni perpekto para makapgsabi ng mga bagay na hindi ka-aya-aya. Catholic ka pala, hehe Ngyon Im very skeptic sa history ninyo, Ako pala ay laging nakababad sa mga secretes of catholism. Sa nakikita ko sa mga comments mo, parang Perfect ang dating ng Religion mo. Well, being "born-again" doesnt really lifts up religion. Relationship talaga sa Panginoon. kaya kung nagrereklamo ka sa mga Testimonies ng mga Born-again Christians, masanay ka na kasi we have experienced God's promises in the Bible. Hindi lang namin inaaral ang Salita niya kundi naeexperience pa namin. If you think we were brainwashed by our pastors, I think the best bat with that is rather, you were brain washed with your own religous view, inttelect and your church leaders. For it is by grace you have been saved, through faith--and this not from yourselves, it is the gift of God--". Huwag din sana natin maliitin ang Biblya. Siguro kaya hidni mo naapreciate ang Bible kasi hindi mo ito talagang binabasa by "heart". kasi SIGURO LANG HA, by mind lang. Tandaan din natin sabi sa Hebrews 4:12, "for the word of God is living and actiove Sharper than any Double edged Sword it penetrates even to the dividing soul and spirits joints and marrows it judges the hearts of man"
And now, kung sinasabi mong kami ang cult, test the spirit first. "Dear friends, do not believe every spirit, but test the spirits to see whether they are from God, because many false prophets have gone out into the world." 1John 4: 1. 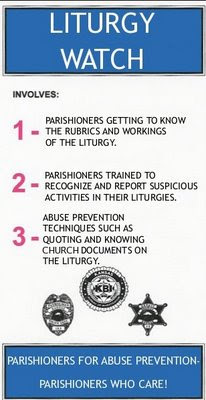 And to martin, alam mo na ba ang dark secrtes ng Catholism? U should find to read or research on it. A 10% percent of a $ 20 million fight of the people's champ is a big thing for a born-again protestant sect! Go Alabang New Life Church! Be rich in earthly wealth! “@Martin siguro yung unknown na yan ay isang baby Chritian palang. Okaya naman isang Katoliko na nashare-an ng isang Born again.” Mr. Bawang, if @Unknown had introduced himself as a member of the protestant “born again” cult like you, then I would have had no problem with that. I would just have proceeded to blasting his erroneous beliefs, wait for my reply to be posted (per Sir TPC’s approval), go on with my life and wait for the next heretic who will come and try to spread idiocies on this CATHOLIC blog. And as Satan would have it, HERE YOU ARE! Kaso lang nagpakilala siyang Katoliko, at doon ako hinding-hindi makapapayag. Hindi siya naniniwala sa mga aral ng Iglesia Katolika at hindi niya kinikilala ang otoridad ng Iglesia, tapos magpapakilala siyang Katoliko? Kungbaga, nagresign ka sa isang kumpanya, pero gusto mo pa din gamitin ang company I.D. mo. O kaya’y itinakwil mo ang pamilya mo pero gusto mo pa din gamitin ang apelyido ninyo. Aba eh MAGTATRAYDOR ka na rin lang, LUBOS-LUBUSIN MO NA! “"The good man brings good things out of the good stored up in his heart, and the evil man brings evil things out of the evil stored up in his heart. For out of the overflow of his heart his mouth speaks." One chapter choc-full of invectives FROM THE SON OF GOD! Or how about St. John the Baptist, does that verse apply to him? Or Saint Paul the Apostle? LAHAT ng bagay dapat ginagamitan ng UTAK, TANGA! Kaya ako nanatiling Kristiyano, kaya confident akong magsalita at humusga at tumuligsa sa kamalian dahil kahit papano’y pinag-aralan ko at pinag-isipan mula noong kabataan ko ang mga bagay ukol sa aking Iglesiang kinaaniban, ang mga ibang samahang nag-aangkin na sila ay tatag ni Kristo, maging ang ibang relihiyon, LIBAN PA SA AKING PANANAMPALATAYA. Mayroon ba akong sinabi na maarok ang Diyos sa pamamagitan lamang ng talino? Oh eto: Tama nga, dapat sumangguni sa Bibliya, pero hindi ang Bibliya ang nagbibigay ng Banal na Karunungan, ang Espiritu Santo ang gumagawa niyon. Hindi baga nakasulat sa Bibliya na tinuruan ni Kristo ang kanyang mga alagad ngunit hindi nila naintindihan ang lahat ng kanyang mga aral hanggang manaog sa kanila mula sa langit ang Espiritu Santo? Basic na lang iyon hindi mo pa alam?! Iyan ang sinasabi ko, kung iyang mga KABALBALANG ikinakalat ninyo eh napapabagsak na ng simpleng kaalaman at common sense eh why should anybody bother with it? Oh yun naman pala eh! Paano malalaman kung ang nangangaral ay galing sa Diyos? Hindi baga sa…drumroll please…tadaaaa! ARAL! Hindi sa emosyon! Hindi rin sa himala, dahil nakasulat sa Bibliya na ang mga anti-Kristo ay makagagawa din ng himala dahil kinakasihan sila ng DIYABLO! Hindi sa paramihan ng miyembro na ipinapain sa mga pulitiko, gaya ng ginagawa ng mga kulto ng “born-again” at Iglesia ni Manalo tuwing eleksyon! Hindi sa pagandahan ng istruktura (although we Catholics have the most beautiful houses of worship, hehe). Tandaan mo, sa ARAL malalaman kung sino ang nagsasabi ng totoo! Idagdag mo pa ang KASAYSAYAN at LOHIKA, at mapalulubog at mapalulubog din KAHIT ANO PANG IHIRIT NINYONG MGA BULAAN! “Hindi ko alam kung sino sa atin ang na-uto ng mga pastor, pero tingin kolang meron isa sa atin ang naloko na ng pagkahambog. Ay hindi mo alam? Let me tell you: IKAW. NAUTO KA NG PASTOR MO. Simpleng sitas na lang hindi mo pa magamit sa tama eh! So HAMBOG at AROGANTE pala ang Panginoong Jesukristo, si San Juan Bautista, at si San Pablo? Hindi kahambugan ang IPAGMALAKI mong ikaw ay nasa tama, hindi kahambugan na IPAGTANGGOL mo ang katotohanan, hindi kaarogantehan ang na PASINUNGALINGAN at ITUWID ang kasinungalingan at PAGSABIHAN - ayon na rin sa turo at halimbawa ni San Pablo – ng may KABAGSIKAN ang naghahasik nito. If you think that holy humility is supreme, even over zeal for the Lord God itself, then you’re dead wrong. Maari ngang nagbabasa ka ng Bibliya, ngunit natitiyak ko na hindi ka kinasihan ng Espiritu Santo na maintindihan ito. Like my response to @radzk153 who also told me to go research so that I will be “enlightened” about Catholicism, WHY THE HELL SHOULD I DO YOUR DIRTY WORK FOR YOU? Ako ang papagurin mo para magkaroon ka ng pambala laban sa akin (as if naman mayroon, hehe)? Ano ka, hibang? May pa-secret secrets ka pang nalalaman! Kung ano man ang isyu mo laban sa Iglesia Katolika, ilantad mo! Puro ka kuskos-balungos at pasakalye! Kung mayroon kang bayag (if you’re male) at matuwid kang tao, dapat deretsahan at tapat kang magsalita lalo na’t sa ganitong pagkakataon na kaligtasan ng kaluluwa ang pinag-uusapan! O hindi ba’t tama nga ako na puro drama alam ninyo! Show your cards and I’ll play mine! Pero isa lang ang sinisigurado ko sa’yo: TALO KA. Ang totoo, matagal nang TALO ang HUWAD mong paniniwala. Another glaring evidence of stupidity so profound its baffling! Sino ba ang nagtatag ng Iglesia Katolika? Si Kristo! (At kaya kong patunayan ‘yan!) Hindi ba si Kristo ay PERPEKTO? At hindi baga inutusan niya ang kanyang mga alagad na: “Be you therefore perfect, as also your heavenly Father is perfect.” (Matthew 5:48)? Ergo, one should EXPECT perfection from the Church and its members. Ngayon, diyan mo ilabas ang mga sinasabi mong “dark secretes” ng Catholicism (“secrets” na lang ‘di pa maitama ang spelling, mayroon namang autocorrect function itong Blogger site, dakilang katamaran nga naman o!) and I will prove that the Catholic Church WAS, IS, AND WILL ALWAYS BE PERFECT UNTIL THE END OF TIME. O ayan ha, binigyan na kita ng clue, hehe. “Well, being "born-again" doesnt really lifts up religion. Relationship talaga sa Panginoon. kaya kung nagrereklamo ka sa mga Testimonies ng mga Born-again Christians, masanay ka na kasi we have experienced God's promises in the Bible. Hay naku, kung mayroon lang akong sampung piso para sa bawat beses na sinulat dito yang “personal relationship” cow manure (read: B*LLSH*T) na iyan na walang pruwebang sitas na kasama eh nakabili nako ng bagong sapatos! Kasi WALA naman talaga. Tingin ka sa mga naunang comments diyan sa taas kung iyong mga sinulat ng kagaya mong erehe eh mayroon! Mayroon ba? Wala! EH ‘DI NGANGA!!! Ngayon, kini-claim mo na nae-experience ninyo ang Salita ng Diyos, eh BAKIT NAGAWA KONG I-DEMOLISH LAHAT NG KALOKOHANG PINAGSASASABI MO DITO? ISA LANG IBIG SABIHIN NUN: KUNG ANO MAN YANG “EXPERIENCE” NA PINAGMAMALAKI MO, EH GALING KAY SATANAS IYON, HEHE. “"For you are saved by GRACE through faith, and this is not from yourselves; it is God’s GIFT— not from WORKS, so that no one can boast." - Ephesians 2:8-9"
Salvation by grace through faith AND works. Iyan ang buong turo sa Bibliya, at iyan din ang tinuturo ng Iglesia Katolika. “Huwag din sana natin maliitin ang Biblya. Siguro kaya hidni mo naapreciate ang Bible kasi hindi mo ito talagang binabasa by "heart". kasi SIGURO LANG HA, by mind lang.” Ay oo, sobrang minamaliit ko ang Bibliya, kaya nga mas marami akong naibigay na Biblical references para patunayan ang mga sinasabi ko eh, samantalang iyong lilimang naibigay mo, pinatunayan ko pang mali ang pagkakaintindi mo at pagkakagamit! Ay naku Boy Bawang, you are an utterly worthless adversary! Kung hindi lang dahil sa mga maaring maligaw dahil sa iyong KASINUNGALINGAN eh hindi kita pag-aaksayahan ng panahon! O ngayon, ako naman! QUESTION: 1) For around three hundred years after the Ascension of the Lord there was no "Bible", so how were Christians able to know and preserve the True Faith, especially through the Great Persecutions? 2) WHO decides whether or not what is written in the Bible is being correctly taught? Aabangan ko ang mga kasagutan mo. The post started last Feb and was still alive until July 12. Maybe the protagonists/antagonists are just doing their homework?! I saw only one brave person responded to TPC's question: Where did you get the bible? And apparently the person just wrote (short of saying copy-pasted) the answer without believing in it. Woe to the gospel writers! Woe to the Catholic Church! Look what they did with all these zealots! The Christendom is divided (and continue to multiply). When a person grabs a bible, read it, prays for guidance from the holy spirit, he has instant enlightenment! He will found his denomination (Calvin, Luther, Smith, Sagun (nee Manalo), Soriano, and the list goes on) and proclaim others as false and his is the true one! Pax et Gratia Domine Jesus Cristi sit semper vobiscum!! Agimus tibi gratias Domine pro defesonris Fide, for your zeal in Defending the Unam Sanctam Catholicam et Apostilicam Eccelesiam, Corpus et Sponsi Jesus Cristi. Keep up the good works, defend the Faith as St. Peter said that we must "Always be prepared to give an answer to everyone who asks you to give the reason for the hope that you have. But do this with gentleness and respect," 1 Peter 3:15. Per Maiorem Dei Gloriam, et Beatae Maria Semper Virginem. Isn't it Good to change people through words of God? why then you people criticizing and badmouthing much of those who are sincere in devoting relationship with God? mat 15:11 "What goes into a man's mouth does not make him 'unclean,' but what comes out of his mouth, that is what makes him 'unclean.'" isn't It more worth appreciating to see Manny changed and left his past CARNAL nature and start living as a Spiritual Man?? It is not the Pastors, religion, preachers that changes people but only through the words of God guided with the Holy Spirit. Mark 9:38-40" "Teacher," said John, "we saw a man driving out demons in your name and we told him to stop, because he was not one of us." "Do not stop him," Jesus said. "No one who does a miracle in my name can in the next moment say anything bad about me, for whoever is not against us is for us. @eppat143, sorry to say, isa ka na naman sa mga NALOKO ng mga BULAANG pastor na ito na walang ginawa kungdi BALUKTUTIN ang laman ng Banal na Kasulatan upang MAHUTHUTAN ang kawawang taong naakay ng mga ito. Hindi ba sila ang nagpakulo ng KAULULANG aral na hindi kailangan ng relihiyon at iglesia upang ikaligtas ng tao, samantalang MARAMING BESES na naming sinupalpal ang mga nagtataguyod ng gayong aral sa comment thread na ito ng mga sitas na mula sa Bibliya din? At hindi baga napakalaki ng pakinabang nila sa aral na iyon dahil wala silang awtoridad na pwedeng silang pagpanagutin liban sa kanilang sarili? TANONG: Iyon bang pangyayaring binabanggit mo ukol sa lalaking nagpapalayas ng demonyo ay nangyari bago o pagkatapos manhik sa langit ang Panginoong Jesukristo? Hindi baga bago? Bakit ko naitanong ito? DAHIL SA PAG-AKYAT SA LANGIT NG PANGINOONG JESUKRISTO KANIYANG INIUTOS NA BAUSTISMUHAN ANG SINUMAN NA TATANGGAP SA KANYANG ARAL! AT HINDI BAGA IPINANGAKO NIYA KAY SAN PEDRO NA ITATAYO NIYA SA KANYA ANG KANYANG IGLESIA, NA SIYA NAMANG NAGANAP NANG MANAOG ANG ESPIRITU SANTO SA ARAW NG PENTECOSTES? AT NATITIYAK KO, KUNG HINDI NATALIKOD ANG TAONG TINUTUKOY SA SITAS NA BINAGGIT MO, AY TIYAK NAGPABAUTISMO SIYA AT UMANIB SA IGLESIANG TATAG NI KRISTO AT PINAMUMUNUAN NI SAN PEDRO AT NANG KANYANG MGA TAGAPAGMANA NG KATUNGKULAN. Napakasimpleng Biblical exegesis pumalpak ka pa, TANGA! Palibhasa pinapurol na ang utak mo ng mga pastor mong pulpol! Ngayon, gaya ng PAULIT-ULIT ko nang isinagot sa inyong mga EREHE, HINDI NAGBAGO SI PACQUIAO! Inalis lang ni Satanas ang pagkagumon niya sa bisyo upang mapanatili siyang lubog sa kumunoy ng maling aral ng mga bulaang pastor, ng paglaban sa TUNAY na aral ni Kristo at ng Iglesiang kanyang itinatag. MAS MAY PAGASA PA SIYANG MALIGTAS SA KABILA NG ALAK AT SIGARILYO KAYSA SA PAGPAPAAKAY NIYA SA MGA KAMPON NG DIYABLO! Panghuli, hindi maaring maging parte ng iisang katawan, iisang organisasyon ang mga taong may magkakasalungat na paniniwala at prinsipyo. Protestantism is different from True Christianity - Catholicism, as gold is different from lead. One imitates the real thing, pero kahit baligtarin mo pa ang mundo ang isa ay mananatiling tunay, at ang isa ay mananatiling PEKE. Mag-aral ka at magsisi, dahil kung abutan ka ng kamatayan ngayon, tiyak na sa IMPIYERNO ang tuloy mo dahil isa kang REBELDE sa Iglesiang itinatag ni Kristo. "While that pastor languishes, Father Marlon Beof, a Catholic priest from Oxnard who has delivered more than a dozen of Pacquiao's pre- and post-fight Masses, said he has been invited to preside over the services again this weekend in Las Vegas. "St. Augustine had a restless heart too," Beof said. "But he ultimately found the truth in the religion he belonged. I see that in Manny. That's my hope." Pacquiao has been won over by the heretic Evangelicals. Lost! 23 Being born again , not of corruptible seed, but of incorruptible, by the word of God, which liveth and abideth for ever. HAY!!! NAKU!!! TINURO BA SA INYO PAG-DEBATIHAN ANG "WORD OF GOD"??? Born Again Hates Blessed Virgin Mary so it means that their church is leaded by satan!